Astrophotographer Chris Schur captured this view of the comet C/2016 R2 (PANSTARRS) on Jan. 17, 2018. A rare carbon-monoxide comet turns deep blue as it whizzes through the inner solar system in a series of images by astrophotographer Chris Schur. 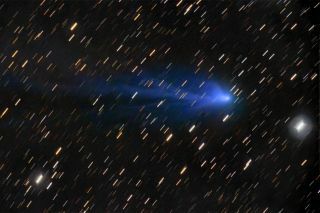 Named C/2016 R2 (PANSTARRS), or R2 for short, this comet is unusually rich with ionized carbon monoxide, which glows increasingly blue as it gets closer to the sun. "That is the gas carbon monoxide making its appearance," Schur told Space.com in an email. Comet C/2016 R2 (PANSTARRS) on Jan. 5, 2018. Comet R2 was discovered in 2016 by astronomers using the Pan-STARRS telescope in Haleakalā, Hawaii. It was closest to Earth on Dec. 23, 2017, when it was a safe distance away: roughly 191 million miles (307 million kilometers). The comet will make its closest approach to the sun on May 9, 2018. If it doesn't burn up and disintegrate as it swoops around the sun, the comet will then start making its way back toward the icy outer region of the solar system known as the Oort Cloud. Comet C/2016 R2 (PANSTARRS) on Jan. 12, 2018. Assuming that the comet survives its trip around the sun this time, C/2016 R2 will swing by Earth and the sun again — but not for another 20,228 years, according to NASA's small-body database. To capture these images of the comet, Schur used a 10-inch Orion astrograph reflector telescope with an ST-10XME self-guiding CCD camera.